Just past the half way point of the 2018 season of Thursday Thunder presented by Papa John's Pizza, the intensity ratchetted up in Week 6 as drivers vied for ever important points in championship battles. The rookie bandoleros took to the track first and from the point, Matthew Bryson of Dallas dominated the feature. Matthews outpaced Lee Brown of Acworth who finished second and Gianni Esposito of Dacula as he led all 20 laps to capture his second checkered flag of the season. With rain washing out bandolero action last week, the GRT Racing Development Outlaws and the bandits divisions made up their week 5 feature races sandwiched around the nightly autograph session. The first of the two make-up races featured the GRT Racing Development Outlaws. Blaize Maddox of Locust Grove notched his third consecutive win to pull the points race ever close in the division. Max Brady of Marietta jumped out to an early lead through the first three laps, but a pair of back markers brought out the caution bunching up the field. Maddox and Brady along with Kenneth Henderson of Alto went three wide in turn four bumping and banging for the lead. Brady got pushed out of the groove and back into the pack while Henderson also got tangled up and slipped out of contention leaving Maddox on the point. Nobody could use a late race caution and ensuing restart to get past Maddox. He held all the challengers at bay to capture the checkered flag. In the first of two bandits features of the night, Carson Ruark of Suwanee dominated from the pole for his third consecutive win of the season. After a caution on the opening lap resulted in a complete double file restart, Ruark left no doubt as he jumped out to an early lead and cruised to the win. The battle for second saw Kelley Puckett of McDonough and Jaiden Reyna of Yorktown, VA flip-flop the second position over the final 7 laps. Reyna was able to out duel Puckett for the spot. Rolling into the week six features, Austin MacDonald led for only a couple of hundred in feet the Associates Group Young Lions feature. But it was the final hundred feet of the race and it earned him a trip to victory lane. MacDonald lingered near the front of the field throughout the race despite a handful of cautions in the event. As time expired, a final caution forced a green-white-checker finish. Michael Gannon of Canton, who led for much of the race, held the lead on the ensuing restart and the green-white-checkered. MacDonald closed the gap on the final lap as he sprinted down the backstretch. He made a move on Gannon dropping to the inside and muscling to the lead on the exit of turn four and crossing the stripe as the leader. On paper it looked like an easy win for DJ Canipe in the Semi-Pro feature as he led every lap to notch his first win of the season. "It was a good race and I know that they were really close and I just had to run my line around the race to keep them behind me," said Canipe. "You just have to be smart and use your mind." Canipe overcame half a dozen restarts and challengers banging his back bumper. He held off David Rochester of Lebanon, TN, Sammy Smith of Johnston, IA and Andrew Dollar of Atlanta as the trio could not find a lane to get past the leader. Dawson Fletcher of Canton qualified first and selected the pole position for the feature race in the VP Racing Fuels Pro Division draw. He used track position to win his third of the season and take the points lead through six events. "The first half of the race was great," said Fletcher, "but with every caution I was getting scared. I knew Cody [Hall] had a fast car and Rafe [Slate] had a fast car. Cody Hall of Griffin and Rafe Slate of Eatonton finished second and third respectively. The pair flip-flopped second throughout the night but neither could figure out how to get past Fletcher once they got right up on his back bumper. "It was really just who could put it together there at the end," explained Fletcher on the victory. 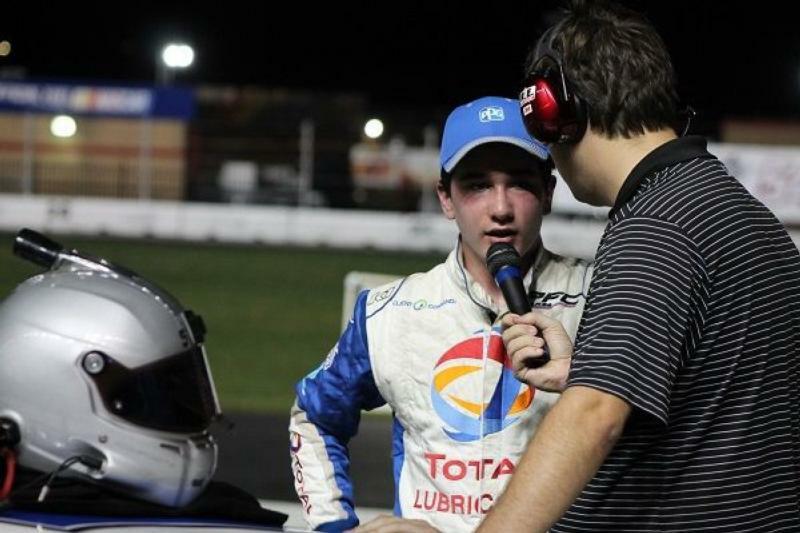 "Luckily I was able to hold off Cody and the car was super-fast all night." It was as clean sweep of feature races for Blaize Maddox as he led all 20 laps to earn the win in the second GRT Racing Development Outlaws division feature of the night. Kenny Brady of Marietta and Kenneth Henderson of Alto battled for second midway through the race. Brady prevailed and finish second while Henderson slipped to fourth. Justin Gareis of Charlotte finished third. After his worst finish of the year last week in eighth and a trio of second place finishes, Robbie Woodall of McDonough returned to victory lane for the first time since opening night. "That was a much easier race than opening night," said Woodall. "Bill [Plemons Jr.] had some back luck earlier tonight that set me up for an easy drive." In addition, Woodall, snapped the record breaking and four race winning streak of Locust Grove's Bill Plemons Jr. The oldest competitor to post a win in a Legend's car, Plemons sets a new mark with each subsequent win. In the second Bandits feature of the night, Carson Ruark of Suwanee looked to sweep both events but came up just short after leading more than half the race. Ruark was spun by Landon Rapp of Concord, NC with half a dozen laps to go and couldn't recover. Despite a host of cautions over the final six laps allowing Ruark back into the picture, he didn't have enough time to reel in Jaiden Reyna of Yorktown, VA.
On the final restart of the night, Reyna drove out into the lead heading into turn one and held off the field. He notched the win in his first career appearance at Thursday Thunder. The Thursday Thunder Legends Series presented by Papa John's Pizza continues with Week 7 next Thursday, July 12. Infield admission is available for spectators wishing to watch Thursday Thunder, and passes may be purchased at the Security Command building near the speedway's main entrance. Infield passes are $20, while grandstand tickets for the affordable, family-friendly racing series cost just $5, with children ages 5 and younger are admitted free. For more information, contact the Atlanta Motor Speedway ticket office at (770) 946-4211, (877) 9-AMS-TIX or visit www.atlantamotorspeedway.com.